Photo credit: Anthony P. Jones via www.photos.edmonton.ca. This list will be updated as I find new events and as event information becomes available. Keep checking back for updates – usually more events are announced closer to the date. Please leave me a comment below, send me an email or tweet me with any events you think should be added to the list! I’m always looking for new ideas! 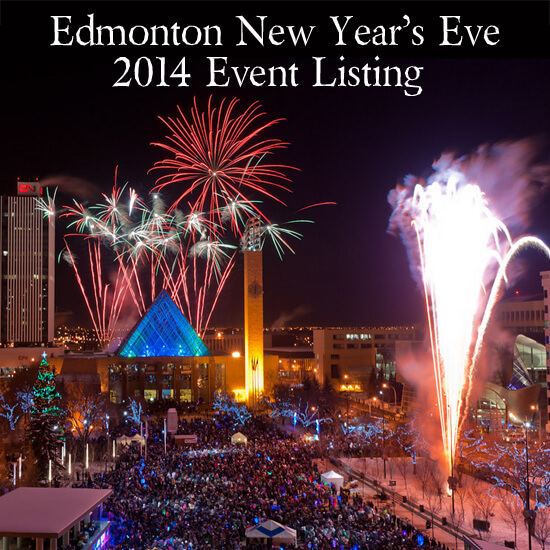 Details: It’s the annual New Year’s Eve festival in downtown Edmonton. There will be various family friendly activities, indoor and outdoor, performances, fireworks and more! Complete details to be announced. Time: Beginner Swing Dance Lesson starts at 8 p.m. Gala from 9 p.m. to 2 a.m. Location: Sugar Foot Ballroom, 10545 81 Ave. Details: Sugar Swing’s annual New Year’s Eve Party is the best way to bring in the New Year, Held every year since 2007, this incredible event is always sold out! This year the glitz and glamour of Hollywood comes to Sugar Swing as we present Good Old Hollywood: A New Year’s Eve Gala. On December 31st, we will immerse you in the fantastic world of celebrities, stars, and characters of classic Hollywood films from the 1920’s-1960’s. Our classic Hollwood-themed party will feature live performances, food and champagne, vintage fashion and cocktails, as well as Sugar Swing’s finest DJs playing your favourite tunes from the 1920s-1940s for your dancing pleasure. Time: Cocktails 7 p.m. Dance & Cirque du Soleil-style show from 8 p.m. to 10 p.m. and Dance from 10 p.m. to 3 a.m. Details: A spectacular evening of food, fun and entertainment in support of the Stollery Children’s Hospital Foundation. One of the Top 10 New Years Eve Events In Canada. Our guests will experience an unforgettable evening of unparalleled entertainment at this highly exclusive event in the Fantasyland Hotel. Entertainment will include a beautiful, stylish and hypnotic circus performances and plenty of whoops and ahhhs…. Time: Doors open at 6 p.m. Dinner at 7:45 p.m. Dance at 9 p.m. Details: Latin New Year’s Eve 2014 at The Delta Edmonton South Hotel will be an extravagant NYE to remember. Sit Down and relax to the beautiful Latin rhythms of International Bachata Artist DOMENIC MARTE and TREMENDO from Puerto Rico. Local Artist Edgar Cruz will also open for the Headliners. Party this NYE away with Edmonton’s hottest Latin DJs, DJ LEO RL Playing the best in Latin, and Top 40. Time: 7 p.m. or 10 p.m. Details: Ring the New Year in laughing at the Comic Strip! Join us December 31 , 2014 for our New Years Eve Celebration, 3 great acts, 3 great packages and party favours! Featuring Mike Vecchione, Sean Lecomber and Paul Myerhaug. Time: Begins at 5:30 p.m. Location: Northlands Park (7410 Borden Park Rd). Details: Park. Northlands Park. The place where New Year’s Eve leaves you shaken AND stirred! Choose from a variety of different packages and get ready for a night of glamour, prizes, intrigue and live racing action. Time: Doors open at 5:30 p.m., Dinner/Show starts at 6:45 p.m. Details: The perfect atmosphere with THE SWING KINGS with Sandro Dominelli & Shelley Jones. Over the years this event is the number one seller in Edmonton and brings you a four course plate service dinner and entertainment you don’t want to miss. This famous band will keep you on your toes all night and will showcase fireworks from Downtown. Book your tickets soon because this event is a SOLD OUT SHOW every year! Funk in the New Year with the Super Band! Details: Dance yourself in to a brand new year with the Funkalicious SuperBand!! A 9 piece group that will keep you grooving right in to 2015!! Website: Funk in the New Year with the Super Band! Celebrate New Year’s Eve with ABBA! Location: Central Lions Senior Citizens Recreation Centre (11113 113 St). Details: Celebrate New Year’s Eve with Abba again! includes delux buffet and complimentary champagne, with special guests the Rault Brother Bands. Website: Celebrate New Year’s Eve with ABBA! New Year’s Eve with Elvis! Time: Doors open at 7 p.m., dinner at 8 p.m., show & dancing at 9 p.m. Details: New Year’s Eve with Elvis! (Robin Kelly’s tribute to Elvis). Includes complimentary toast at midnight, door prizes and buffet dinner. Website: New Year’s Eve with Elvis! Location: Blue Chair Cafe (9624 76 Ave). Details: A rocking New Orleans-style party including an exquisite seven-course dinner! New Year’s Eve at the Blue Chair Cafe with Rooster Davis Group with Ann Vriend. Details: Spend New Year’s Eve watching Top of the Rocks: A British Invasion at the Mayfield Dinner Theatre! Jumping to the other side of the pond, this year we celebrate all things British. From the original Invasion of the 60’s to the second wave of the 70’s, the new wave of the 80’s, right up to the superstars of the present day, TOP OF THE POPS captures it all!! With the music of the Beatles, the Stones, The Hollies, The Who, Adele, Amy Winehouse and everything in between, this year’s rock ‘n roll extravaganza pays homage to the British contribution to the world of popular music. An evening of high-energy hilarity awaits you with an ensemble cast that will knock your socks off! Details: Celebrate this New Year’s Eve at The Melting Pot! This unique New Year’s idea will be the best one you have made yet! From a burst of joy after a bite of fondue, or a satisfied sigh after a sip of wine, to the simple sparkle of a smile, or a twinkle in an eye—there will surely be fireworks. Only instead of just watching them, you’ll be creating them. Celebrate this New Year’s dinner with taste and style. Fruit-infused specialty drinks. Champagne. Chocolate covered strawberries. Time: Dinner and show starts at 6 p.m. Show only begins at 9 p.m. Details: The Red Piano presents GOTHAM New Year’s Eve Party! Dinner, dancing, live duelling piano show. Details: Celebrate with us as we head towards our 65th year with a seven-course plated dinner, live band (Aura) and dancing! Location: Muttart Conservatory (9626 96A St). Details: Bring the family to Muttart and celebrate the New Year early! We’re putting on a masquerade ball, so come in costume and enjoy the live music, crafts, and fun activities for everyone. Enjoy hourly midnight countdowns with treats to ring in 2015! Location: The Artery (9535 Jasper Ave). Details: Ring in the new year at The Artery with Luke Thompson and the Collective West! Location: Von’s Steak House & Oyster Bar (10309 81 Ave). Details: Vons will be hosting an exquisite four course meal prepared by Executive Chef Shane Chartrand. Time: Starts at 7 p.m. Details: This New Years Eve, we welcome you back to the Shaw Conference Centre for an event of epic proportions. The world’s biggest DJ returns to Edmonton after two years hiatus to perform on the most celebrated night of the year.. NEW YEARS EVE! Last year Mike and I invited some friends over to do a fondue party for New Year’s Eve! It was so much fun. We got three fondue pots and a hot stone grill, had way more food that we needed (that’s always better than not having enough), and had so much fun! Here’s some tips from Canadian Living on hosting your own fondue party. Mike and I are big fans of board games! This New Year’s we’re excited to crack open Telestrations, try Cards Against Humanity, and guaranteed fun Catchphrase, Settlers, Cranium, and more! Here’s a list of some popular board games you could try for a board game New Year’s Eve night. Time: Jan. 1, 2015: 10 a.m., 11 a.m., 12 p.m., 1 p.m. Details: Start the new year with a bang. Bring the gang for a slap-up meal at the historic Hotel Selkirk. Enjoy some old fashioned hospitality and then take a stroll around the Park. Culinary Director Jasmin Kobajica has created a menu with everyone’s favourite brunch staples, a delectable carving station and luscious chocolate fountain.